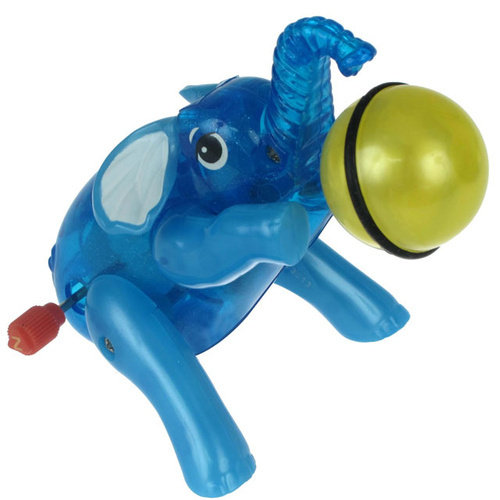 Z Wind Ups - Eddie the Performing Elephant | Collect Them All! Eddies does tricks for treats! Wind him up and watch him spin his ball! It's a good thing they make balls in extra-large sizes, or else Eddie would need to find a new trick for getting treats. The best-fed elephant in the Berlin Zoo, Eddie is an expert at coaxing snacks out of unsuspecting visitors when his trainers aren't looking. Eddie the Performing Elephant is one of many Z Wind Up toys that have re-introduced the simplicity and innovative design of toys! No batteries, electricity or high technology is needed to run this wonderful wind up - he'll put a smile on the face of those young and old. Made of translucent plastic so you can see the inner functions of your wind up, Eddie the Performing Elephant is 7.6cm high and will be an instant classic with your family. Wind Eddie up and watch him spin his colourful ball around, lifting it up over his head whilst kicking his feet in 2 different speeds, then dropping the ball to start again! His skills will surprise and delight you. So have fun with Eddie the Performing Elephant today!